Only Thor knows exactly how he got to Northern California after running away from his home in San Marcos, Texas, during the severe floods in late May. The friendly, 16-month-old Pit Bull was seen jumping off the back of a truck Sept. 26 in Crescent City. A police officer took him to the Del Norte County Animal Shelter, where it was fortunately discovered he had a microchip with information about his dog dad, Eddie Hurtado. Over Memorial Day weekend, Thor had bolted as his family evacuated their house, which was flooded by the rising Blanco River, Hurtado told the Associated Press. Their two other dogs returned home, but Thor did not. Hurtado had spent weeks looking for his missing dog. Thor had some fur loss and fleas, and was slightly underweight, but was otherwise fine. 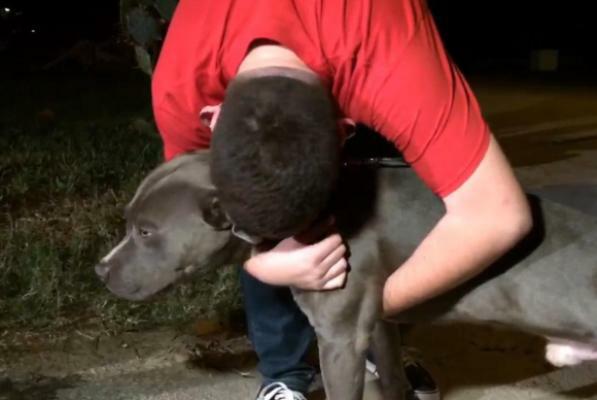 Before Thor could be returned home, more severe weather swept through San Marcos. Once again, the Hurtado family had to evacuate their home due to flooding. 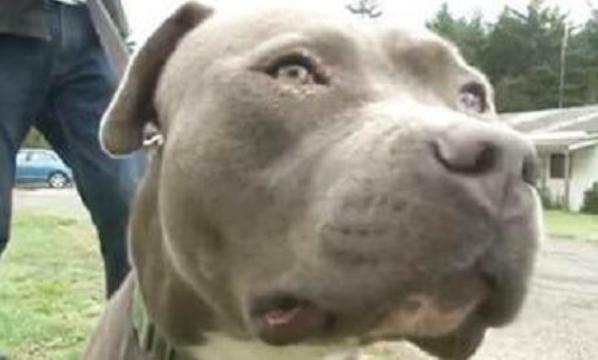 Thor stayed at the shelter while his family recovered. “Certainly after everything they’ve been through, the least we can do is keep him safe here,” Riggs told KIEM. Hurtado couldn’t afford the $1,500 cost to have Thor transported back home to Texas, but Jess Williams and another good Samaritan donated the money after seeing Thor’s story on the KEYE TV Facebook page. Bruce Heinichen, a truck driver hauling a boat to Texas, offered to bring Thor along with him. On Saturday, the two took off from Crescent City. Along the way, Heinichen sent the Hurtados photos of Thor relaxing and chewing a bone. Finally, after over five months apart, Thor and the Hurtado family were reunited last night. As you can see, it was a very happy reunion.